Shoveller (Anas clypeata). Male. Taken at Titchwell, Norfolk, on October 24th 2015. Male. Taken at Titchwell, Norfolk, on October 24th 2015. Shoveller (Anas clypeata). Female. Taken at Titchwell March, Norfolk, on October 24th 2015. Female. Taken at Titchwell March, Norfolk, on October 24th 2015. This species is unmistakable owing to its large spatulate bill. The breeding male has a green head, white breast and chestnut belly and flanks. In flight, pale blue forewing feathers are revealed, separated from the green speculum by a white border. 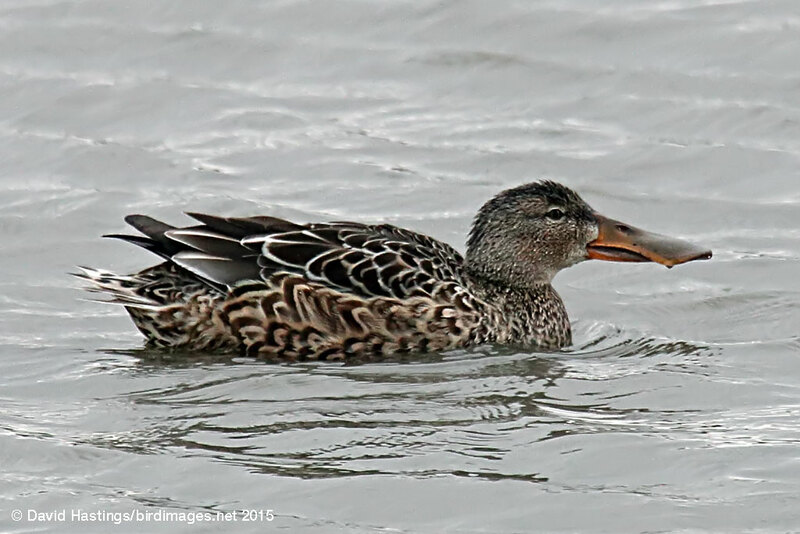 The females is light brown, with plumage much like a female Mallard, but easily identified by the long broad bill. 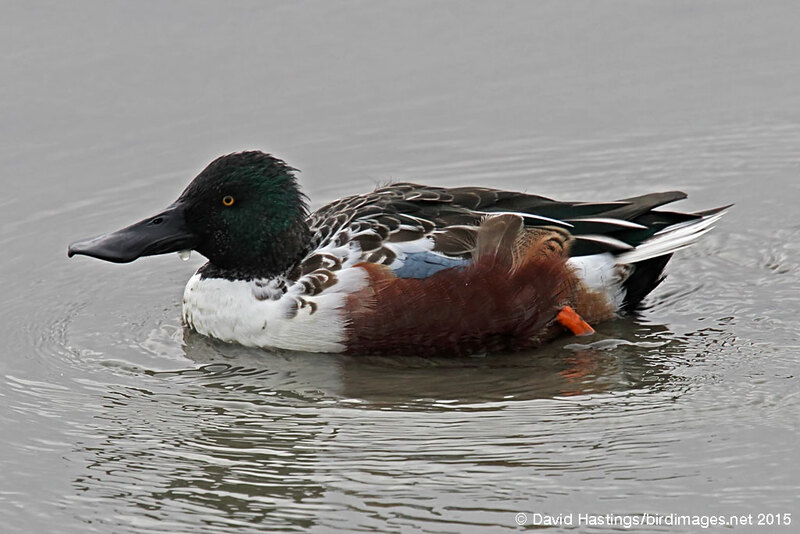 In Britain the Shoveler breeds in southern and eastern England, especially around the Ouse Washes, the Humber and the North Kent Marshes, and in much smaller numbers in Scotland and western parts of England. In winter, breeding birds move south, and are replaced by an influx of continental birds from further north. It breeds on shallow, eutrophic lakes with rich vegetation, or marshes with sufficient open water. There are between 1000 and 1500 breeding pairs in the UK. Around 18000 birds spend the winter here. Its conservation status is amber, owing to the UK being home to more than 20% of the NW European population.